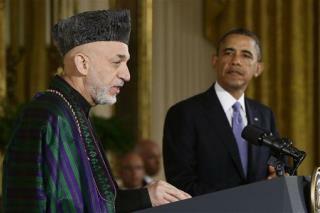 (Newser) – Afghanistan President Hamid Karzai says he's "done enough; it’s time for me to move on." But ahead of April's elections to replace him, Karzai is reflecting on his time as president—and his anger at the US government—in a lengthy Washington Post interview. Furious about civilian casualties of the war, he says the US should have spent more time focusing on Taliban strongholds and less time targeting Afghan villages. "Afghans died in a war that’s not ours," he says, reflecting on a 4-year-old girl who lost 14 family members—and half her face—to an American airstrike. When I see good, I am in approval. When I see the losses of Afghan people, our children, maimed and killed, I’m in disapproval." That's such a big pile of B.S. that i hardly even know where to begin... HIS PEOPLE are Islamic fanatics who burned nuns, slit the throats of dozens of students at a school, murdered members of a polio vaccination team, bombed restaurants and markets, massacred over a hundred villagers and even waded into a train station to stab over thirty Chinese commuters to death - all in the past week. People were slaughtered explicitly in the name of Allah in a dozen other countries as well. At the same time, Muslims are the only people who attach the word "phobia" to the end of their religion and pretend that it is irrational to even think that Islam is different or dangerous. So Karzi wants the good without the bad. He wants freedom for the country without any cost or sacrifice - except by America and Americans (and our allies). It is LONG PAST time for him to , BUT I am concerned WHAT (or who) will follow. In a fourth world country (if there is such a thing) where corruption, goats and drugs are the staples of life we waste our people's lives and the nation's money trying to develop a democracy and build an honest nation. I think he is telling it like it is. This was another special interest war, where congressional crony contractors got rich and the rest of us got the run around.